This is the highest level of cave diving in the TDI curriculum allowing divers full cave penetration beyond the 'light-zone'. Exposed to more sophisticated cave cave diving exercises and scenarios as well as diving in more complex cave environments. Techniques learned in during Cavern and Intro to Cave are refined and complex navigation skills are emphasized. 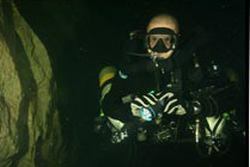 This course covers all the necessary skills, knowledge, procedures and rescue techniques to conduct full penetration cave dives. The objective of this course is to train divers in the proper planning, procedures, hazards and emergency situations of diving in an overhead environment. Full wreck penetration involves greater risks, including the risk of getting lost within the structure, the risk of complete darkness during a light failure and the risk of getting entangled in guide lines or cables. Covering skills such as line deployment, proper light use, black mask swims & touch contact. 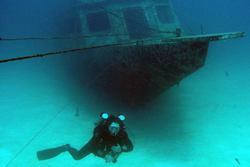 This three day course has a day of theory and line-use workshop, followed by two days of wreck diving. Helping a fellow diver in need is a challenging exercise which requires proper training and lots of practice. Designed to train you in the latest rescue procedures applicable to technical diving, this unique course takes you through the emergency procedures, protocols & essential skills as well as equipment considerations and safety equipment to provide complete assistance to another diver. This course covers a day of theory and six scenario dives over four days of training. 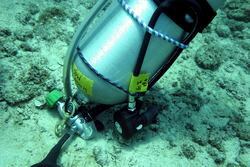 Diving in sidemount configuration is the process of mounting one or two cylinders on either side of your body. Thus having the benefits of having a more streamlined profile, reducing drag and increasing the ability to move though the water. 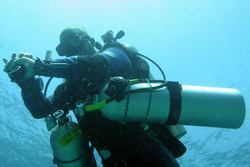 The objective of this course is to train divers in the proper techniques, equipment requirements and potential hazards in using a Sidemount configuration. Upon successful completion of this course the candidates have the ability and knowledge to dive using a sidemount configuration in a none overhead environment. This course can also be combined with the TDI Advanced Wreck & the TDI Cave course. Using a Diver Propulsion Vehicle has many benefits extending the linear range of your dives, but does also require special considerations in dive planning and gas management, specialized skills and proper buoyancy techniques to operate safely. This three day course includes a day of theory and maintenance workshop followed by two days of diving. This course demonstrates the proper procedures needed for the preparation and blending of oxygen and helium based gases. During this one day course students will master all the techniques required for blending quality nitrox and trimix gases used in technical diving both within a facility and out in the field. * 50 dives have to be deeper than 20m & all dives have to be deeper than 9m.